The new year has started well, with the initiative to deliver new medical centres finally gathering momentum. 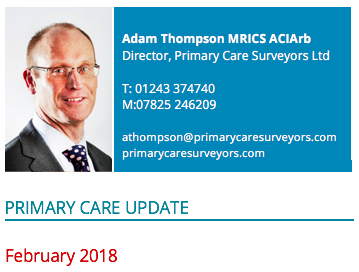 CCGs are demonstrating a tendency to be more receptive towards considering proposals for new medical centres, where the proposals are deliverable, which is most encouraging. The main scheme for funding is the Estates and Technology Transformation Fund (ETTF), a condition of which being that the target date for the new medical centres to be up and running is 31 March 2019. However, this deadline is now likely to be overshot in the majority of instances, although a revised deadline has not yet been published. This is partly because of frustrations over the approval process. Some schemes have achieved allocation of funds, yet moving towards formal approval is still rather unclear. This currently frustrating situation is playing out while we await the revised NHS Premises Directions, which have been promised for the last two years and which I understand are now in the final negotiation stage. It is not until the Directions have been finalised that I expect a revised timetable for the ETTF scheme will be published. Commitment to the ETTF scheme remains strong and there are encouraging signs that the focus is shifting towards schemes that are deliverable rather than fanciful. This has come from the realisation that some schemes for which funds had been allocated, are not achievable. Where schemes are now being considered, the emphasis is very much being placed on “transformation” and how healthcare services can truly be reformed. This leads on to the discussion about Super Practices, which in turn runs into conversations about the advent of Accountable Care Organisations (ACOs) and Accountable Care Systems (ACSs). Certainly there is consensus that working at scale is the direction in which we are heading, but the format of the scale is yet to be known. In some areas Super Practices are pushing ahead, whilst in other areas there appears to be a desire to sit back and wait to see what emerges by way of ACOs/ACSs. This has been given further credence by the Government’s response to the Naylor Review. The Naylor Review was published in March 2017 and reviewed NHS property and estates. The Government’s response, published last month, is largely supportive of the review’s recommendations to align strategy towards the formation of Sustainability and Transformation Partnerships (STPs), and in time the ACSs. In support of this, the Government is promising a further £3.9billion of additional capital spending on estate transformation by 2022/23. However, there is another NHS body, NHS Improvements (NHSI), that will now have influence over how this money is to be invested. NHSI will work with NHSE to identify evidence from new models of care, the vanguard programme and ETTF, to inform future guidance. That guidance will then influence the Sustainability and Transformation Partnerships (STPs) as to the means of delivering transformation within healthcare. Turning to procurement routes, private capital for funding transformation of estates is being sought. The much maligned PFI procurement route has never applied to primary care, although there is a public-private partnership procurement route referred to as LIFT (Local Improvement Finance Trust) which has been in existence for in excess of 10 years and is likely to continue. The future of LIFT will be covered in future articles, as will what is known as ‘Project Phoenix’ and how this will fit in with LIFT. The challenges facing NHS Property Services are alluded to within the response to the Naylor Review. There does seem to be an objective in expediting the disposal of surplus assets so as to allow for capital to be redeployed to provide new facilities. This is encouraging, although the more topical issue for primary care is the ownership of health centres. Interestingly, the Government has announced that health centres are seen as national assets as opposed to local assets, so any sale proceeds are retained at central Government level. In the meantime, many of the recruitment and succession issues continue at practice level, although anecdotally from speaking to practices, the situation does not seem as bad now as it did one to two years ago – although this is not to say that we are out of the woods. The situation is much worse in some parts of the country than others. Notably, in Scotland there has been a proposal that the health boards will take over ownership of properties from practices, if that will help with the recruitment and succession of GPs, and it has recently been announced that similar proposals are now being considered by NHS England and NHS Wales. This may seem like a quick fix, but I am concerned that this may conflict with the independent contractor status of GPs. Should the assets end up being controlled by NHS Property Services, then the thorny issue of service charges will no doubt raise its head, which may prove to be a costlier issue for practices in the long term.